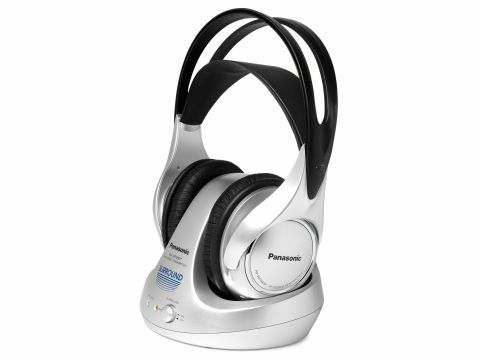 For a few pounds more, Panasonic's RP-WF930s are a wireless pair of cans. At £63, they're a straightforward affair, but the leatherette ear-pads add a sense of luxury and they're solidly constructed. The surround logo on the base station boldly claims its credentials, but unlike the Philips and Sony surround headsets, there's no provision for connecting up 5.1 movie soundtracks via digital input socketry here. Dolby Headphone processing is not incorporated. The wireless headphones sit on top of the base station transmitter and are automatically recharged in situ. Once fully topped up, they can provide up to 20hrs of wire-free listening before they need a recharge, which takes around 24hrs. The expandable headband takes a 'one size fits all' approach, but it's difficult to achieve a snug and comfortable fit. Also, it's made from plastic, which is non-breathable and unpleasantly makes your head overheat. There are four RF frequency channels to choose from, but the RP-WF930s exhibit an annoying low-level background hiss on all channels in our home tests. Unfortunately, activating the pseudo surround mode only serves to exaggerate the hiss further, and actors' voices sound edgy and spluttery during our Master and Commander test disc viewing. Stereo material fares better, and Snow Patrol's Chasing Cars shows what the RP-WF930s can do with music, although there's some noticeable volume limiting as they struggle to cope with the dynamic range of music.